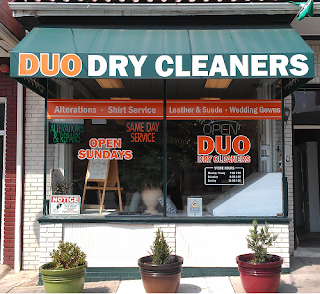 Duo Cleaners provides the finest in all aspects of clothing care and repair by using the most up to date dry cleaning methods and using organic process only! Organic dry cleaning means that we only use enviromentally-friendly and healthy solvent methods and products, as opposed to harmful and toxi solvents that are used in traditional dry cleaning. The same ingredients found in our solvent have been used in cosmetics and food as additives for many decades, which proves that it is absolutely safe for our health and for our environment. 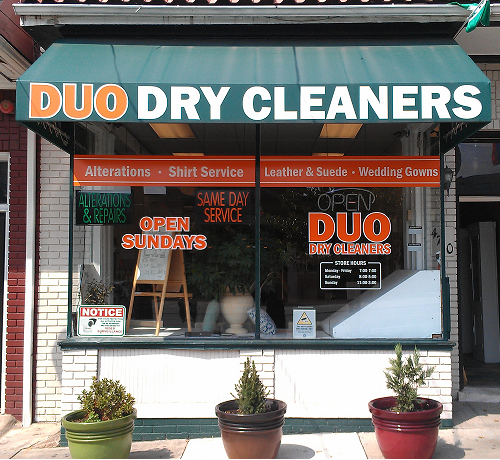 Our dry cleaning is based on a revolutionary cleaningn theory, which makes it the best in the world. Our new method removes more soiling and stains than traditional dry cleaning methods could ever attempt to remove. Our new method is also so gentle that it does no harm to delicate ornaments and fabrics, yet it is still powerful enough to remove all the soiling of your garments. Give your garments the royal treatment they deserve and rejuvenate them with the purest cleaning on earth. This place is awful and the owner is a horrible proprietor. He should have his license and business revoked. Late last week, I visited the cleaning establishment Duo Cleaners which is located at 4710 14th Street NW. I attempted to gain service on the cleaning of 2 pairs of pants and the repair of 2 other sets of pants that had developed a hole in the crouch of both pants. The owner at the time was not on the premises and I was serviced by a young african american woman who provided me the receipt and the date and time the work on my clothes would be concluded. I visited the establishment yesterday, March 14th to pickup my pants and the owner was then present. I am not sure of the owner's name but he has operated the facility for a number of years. Upon pickup of my pants, I had not inspected the pants to see how they were until later in the evening, I had the opportunity to view the pants that they had worked on. The pants though they had a patch to shield the crouch area was insufficiently done because there was still an area of material that was exposed, thus in my opinion, it was not complete. I visited the establishment this morning, March 15th, on my way to work and the owner was present. I explained to the owner that my pants had the patch in the inseam of the crouch area however, because of the lack of material, I could not wear the pants. I therefore concluded to him that if there was an option of refund or store credit, that would suffice to my satisfaction of the work that was not properly done. My position was that if the pants were insufficient when they began to work on them, then the work should not have been done and I should not have been charged $25 for both pairs of pants. I concluded with him that the work was unacceptable and that I wanted to know of other conditions or options that would be available. He refused to hear my statements. The owner concluded that the work was done according to what was asked and refused to conform to the options that I proposed. He then became very irritated and irate. I asked of him if he felt that the appearance of the pants were to his liking and if he would wear those same pants and he soon began to curse at me, saying "F... YOU, You are an Idiot! and for me to get out of his F...ing store" He then informed me to take my clothes and "Get The F... OUT" and that he would not refund or discount any services, while continuing to curse me and call me derogatory names while now moving from his area behind the desk to approach me as if to combat me. He stated quite clearly to me raising his voice that he would call the police and call his attorney to sue me. I was shocked by his behavior and outraged that he exhibited this to me, a consumer from the neighborhood. I support the local businesses in our area but the business owner of this establishment was truly out of line and very relentless in his aggressive manner to harm me. I felt threatened and seemingly felt that I would be assaulted. I contacted the local Ward 4 D Police Department and they concluded that I should reach out to BBB and to DCRA which I have so done. Thank you! Long Island Laundry for their commercial laundry service and lab laundry services in long island. It was a very pleasant & time saver experience, with amazing quality service. The staff was very supporting and gave quality service at an affordable price. They answered all my questions regarding laundry services patiently. Always on time, everything flawlessly folded for a very reasonable price. Thank you Long Island Laundry for they are the best in class laundry service. I would highly recommend them to my family and friends who are looking for best commercial laundry services in long island area.